Much of the talk before the Budget was announced was the need for Labour to get some wins with voters out of the Budget, and so halt the recent declining trend in support for the junior coalitions partner. This poll suggests that any planned boost for Labour has simply failed to materialise, with results instead showing gains for its larger coalition partner Fine Gael, at the expense of Labour support, which slips to a new low level. In fact, Fine Gael end up as the only winners from the Budget, with gains of 2% in the last 6 weeks suggesting their supporters are happy with the Budget. This leaves the party securing its highest share of first preference support for over a year, and it is at the expense in support of both Labour and the Green Party. For the Greens this is not a particular surprise, as the 3-4% they secured in the last poll was a boost, but at the same time somewhat out of line compared to recent trends. In contrast, for Labour this is not good news, as they had hoped recent declines might be arrested by some of the measures in the Budget, such as free GP care for under 5’s. 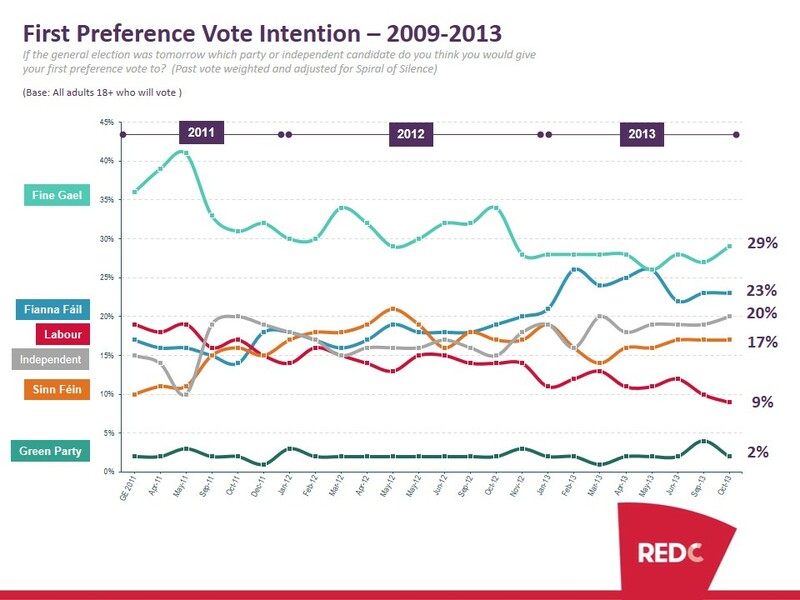 While the fall in support for Labour is only a drop of 1% compared to the last poll in September, it means they have lost 3% of the first preference vote since June, and continues a general downward trend in support for the party. 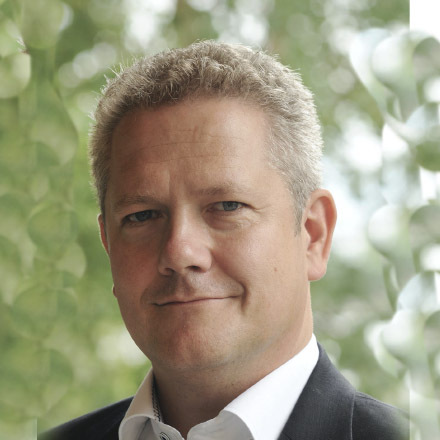 In the past we have seen that one of the key attributes that Labour supporters are looking for from their party is to ensure “fairness” in the actions of the coalition government. So in this poll we asked voters whether they felt the Budget was fair. Just under 2 in 5 (39%) felt that it was, which is of course very similar to the levels of support across the coalition. However, when you dig a little deeper into these figures you find that this is not split along party lines. The key statistic for Labour is that 62% of those supporting the party felt the Budget was unfair. 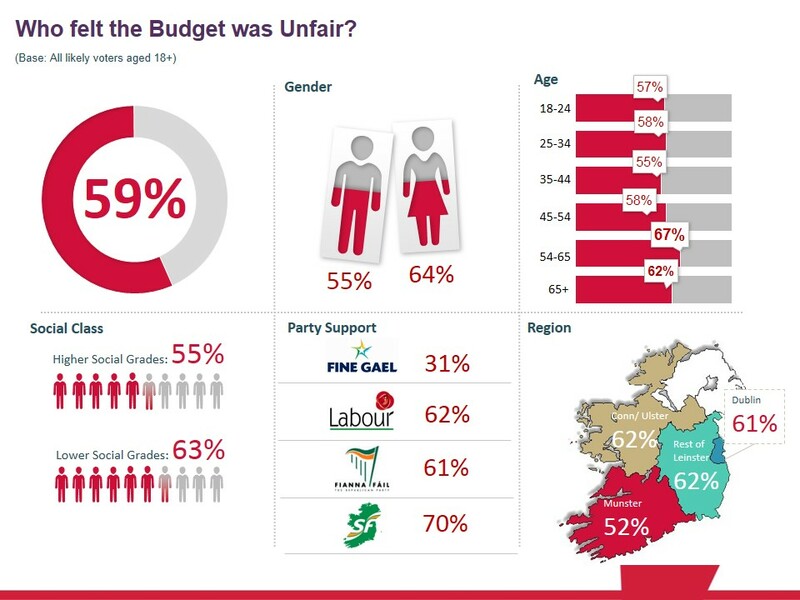 In contrast only 32% of Fine Gael supporters thought it was unfair. This suggests that the measures in the Budget, rather than stop declining support for the party, may well have prompted further defection.